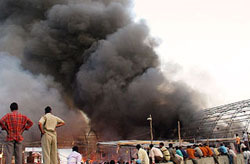 At least 50 persons, including women and children, were feared charred to death and over 100 injured as a major fire brought down three grand pandals like a pack of cards at a jam-packed consumer fair hours before it was to close in Meerut this evening. 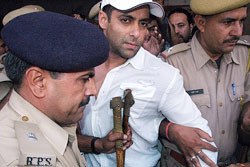 Bollywood heartthrob Salman Khan was today in further trouble with a local court sentencing him to five-year rigorous imprisonment and sending him to the Central Jail here after holding him guilty of killing a rare buck. Following up on her resignation from the Lok Sabha and the National Advisory Council, Congress president Sonia Gandhi has now resigned from all the socio-cultural organisations which she heads or patronises. Jolted by continuing suicides by debt-ridden farmers, the Central Government has decided to launch a special economic package to help mitigate their plight. Agriculture Minister Sharad Pawar, who discussed the proposals for the package at a meeting here today of Chief Ministers of Andhra Pradesh, Maharashtra, Kerala and Karnataka, other ministers and officials, said the package would be formally launched in two months. Five unidentified persons, claiming to be the top echelon of the Punjab police, accompanied by AK 47 wielding gunmen, went to the Golf Range, run by the Chandigarh Golf Association, and after having a lot of alcohol and food refused to pay the bill. In a judgement of far-reaching consequences for lakhs of daily-wage employees engaged by state governments in the country, a five-Judge Constitution Bench of the Supreme Court, in a unanimous decision, today held that such workers could not claim a right of regularisation through judicial verdict. The Punjab Government today granted dearness allowance at the rate of 3 per cent to its employees and pensioners from January 1, 2006, on basic pay plus dearness pay and basic pension plus dearness pension. Dreams of Pakistani national Mumtaz who wanted to marry a Bihari Hindu after her “sensational release” from the high security Central jail here is likely to be shattered even as Sadhu Singh, a resident has withdrawn surety given to a court here. She may be put in jail again where her three minor children have been detained. Nobody is coming forward to stand surety for her being her a Pakistani national.